Taxation is a system that governments use to collect taxes from people and businesses, based on their income, assets, or transaction values. The primary purpose of taxation is to raise revenue for the government, although the government does use taxes to promote beneficial activities, such as starting a business or getting an education, or to limit undesirable behavior, such as smoking and drinking alcoholic beverages. Taxpayers dislike taking the time and effort to comply with the tax code and they certainly hate paying the taxes. To palliate the effects of taxation on the people, tax policy, at least nominally, strives to achieve 2 objectives: efficiency and equity. Tax efficiency minimizes the cost of complying with the tax code by reducing its administrative burden and by minimizing any distortions in the economy caused by the tax. Reducing the administrative burden not only benefits the taxpayers but also the economy since tax collection is not an objective of tax policy, but simply a requirement. Although tax accountants and lawyers help people to comply with the tax code and reduce their taxes, their work has no true economic worth since the need for their help could be eliminated by simplifying the tax code and facilitating the filing of taxes, especially through electronic filing. Besides trying to promote or limit certain activities, much of the complexity of the tax code results from Congress giving preferential treatment to particular groups, especially the wealthy and businesses. This preferential treatment is provided not only in the way that the tax is structured, but also in the form of tax loopholes, which allows taxpayers to take advantage of weaknesses in how the laws are actually worded to circumvent them, thus lowering their taxes in a way that Congress may or may not have intended. Loopholes exist partly because of the complexity of the tax code, but, often, they are inserted intentionally so that the wealthy can use their lawyers to take advantage of them. For instance, there are many obvious loopholes in the taxing of gratuitous transfers that the wealthy take advantage of year after year. Indeed, a large body of law has developed allowing the wealthy to transfer their wealth at a far lower tax rate than what is assessed on working income — in many cases, they can transfer their entire wealth tax-free. Another objective of tax policy that is little heeded is that deadweight losses should be minimized. Although the cost of complying with the tax code does generate some deadweight losses, most deadweight losses are incurred by the tax itself, especially when it is assessed on working income. Another often stated objective of tax policy is that taxes should not distort economic decisions, which occurs when people decide to do something differently because of the tax. For instance, high taxes on working income discourages work because it raises the price of labor for employers and decreases the disposable income for workers. That higher prices reduces demand and lower prices decreases supply are well-established economic principles, yet working income is taxed more than investment income or gratuitous transfers. There is no economic distortion from taxes on gratuitous transfers, because everyone dies eventually, regardless of any tax. Furthermore, there is no deadweight loss from gratuitous transfer taxes. As economists like to say, the supply of death is totally inelastic, while the demand for gratuitous transfers is totally elastic, because the beneficiaries receive their gift freely. Nonetheless, preferential treatment is given to gratuitous transfers because it benefits the wealthy. Taxation equity is the principle that taxes should be fair. However, there are several criteria for determining what is fair. The benefits principle states that people should pay taxes based on the benefits that they receive from government services. For instance, excise taxes on gasoline are used to build roads and bridges. However, taxes on income and investments are based on the ability to pay. The ability-to-pay principle can be classified as vertical equity and horizontal equity. Vertical equity is the principle that people with higher incomes should pay more taxes, such as the provision for the increasing marginal tax rates on higher income. Horizontal equity is the principle that people with higher necessary expenses should pay less tax than someone else with equal income but without the expenses. A common application of this principle is the provision for the numerous deductions and tax credits available for people who have children, allowing them to pay less tax for a given level of income. Another general principle that would make taxation more equitable is to consider the marginal utility of money. As with everything else, the marginal utility of money declines with increasing amounts. Each successive dollar of income holds less value than the previous dollar for the holder. This is because when people have less money, they need to spend it on essential goods and services, such as food, clothing, and health insurance. On the other hand, wealthy people have much more money than what they need for essential goods and services, so they can invest it to make even more money or pass it to their descendants. Extremely wealthy people have so much money that they pay record prices for art, such as the recent payment of $106.5 million for a painting that Picasso painted in only 1 day. So when considering the marginal utility of money, a poor person paying 25% of his income for taxes is paying a much more valuable portion of his income than a wealthy person paying the same percentage, or even a much higher percentage, of her income. It is widely held that the wealthy should pay more taxes, not only a greater absolute amount, but also a greater percentage, based on the benefits principle, the ability-to-pay principle, and the marginal utility principle. The benefits principle applies because the wealthy profit more from police and fire protection, the court system, and national defense, since they have more to protect. Indeed, the Republicans, who are the major party for the wealthy in the United States, fully supports the military and opposes any cuts in their apportionment of tax revenue, even though many seriously question the need for such a large military. On the other hand, the Republicans want to reduce or eliminate payments to poor people or the middle class so that the wealthy can pay even less tax. Based on the ability-to-pay principle, the wealthy should obviously pay a greater percentage of their income, since they reap the greatest benefits from our society. However, the strongest argument for why the wealthy should pay more is that the marginal utility of their money has much less value for them than it does for the working class. When millions of people in the United States are unemployed and can't afford healthcare, it is outrageous to see so many wealthy people pay record prices for paintings and other artifacts that have little real value. The reason for this obvious inequity is that working income is taxed the most, while investment income is taxed considerably less, and gratuitous transfers are taxed the least, if they are even taxed at all. On working income, there is an increasing marginal tax rate and an employment tax. While the increasing marginal tax rate seems to put more of the burden on the wealthy, the 12.4% Social Security tax is applied only to income at or below the inflation-adjusted wage base limit for Social Security, which, in 2017, is $127,200, thus flattening the tax structure. No employment taxes were applied to investment income — which is why they were called employment taxes, because they were only assessed on working income — until 2013, when the new net investment income tax, otherwise known as the Medicare surcharge, was enacted, applying a 3.8% Medicare tax on investment income earned by people with an income of at least $200,000 per year ($250,000 for a married couple). Furthermore, much of the investment income is subject only to the long-term capital gains rate, which is 20% for people in the top tax bracket. Even after adding the 3.8% Medicare surcharge, the total tax rate on long-term capital gains is 23.8%, which is still less than the effective tax rate applied to most working income! And employment taxes certainly don't apply to gratuitous transfers. Furthermore, there is a $10 million+ inflation-adjusted tax exemption for gratuitous transfers for each person. For instance, in 2018, a married couple can give $22,000,000 to their descendants tax-free, while the exemption for working income is zero. The reason why so much money can be transferred without taxation is because Congress has given each individual an inflation-adjusted unified tax credit that can be applied to taxes on gratuitous transfers, allowing at least $11 million to be transferred tax-free. This is a very generous credit, indeed! And yet the Republicans are always complaining about government handouts to the poor, and even to the middle class. Well, here is a handout that is worth literally millions of dollars for each wealthy person, people who have no essential need for the money. Of course, some have argued that to tax gratuitous transfers is to tax the money again, since it was already presumably taxed when the donors received the money. However, double taxation is not necessarily unfair; it is only the total tax burden that matters. For if you think double taxation is not fair, consider the quadruple taxation of working income: marginal tax, employment tax, state tax, and local income tax, all applied to the same income. On the other hand, gratuitous transfers go from the donor to the donee — that is 2 different individuals. And if you want to say that that was double taxation, then why does my housekeeper or gardener have to pay taxes on income that I pay them? Is that not also double taxation? After all, I am paying them with money that I have already paid taxes on. The double taxation argument has always been specious, since money has velocity: it is used in one transaction after another. If the government could only tax money once, it would quickly go broke! The fact is, the tax rate is not applied on money per se, it is applied on the income that people receive, which is yet another reason why the double taxation argument is inapplicable. For years, the Republicans have advocated a flat tax as being more efficient and equitable. However, their version of the flat tax applies only to working income, and usually involves only lowering the top rates, and does not incorporate the employment tax, which means that it is little different from the current status quo. However, an increasing marginal flat tax, with few deductions or credits, that applies to all income — whether it be working, investment, or inherited income — and that subsumes all other taxes on income, especially the employment taxes, would be both efficient and equitable. A major benefit of a progressive marginal tax rate is that it will have a greater stimulatory effect on the economy. Republicans have always argued that tax breaks stimulate the economy. However, tax breaks to the poor and middle-class stimulates the economy the most, since the marginal propensity to consume is higher; tax breaks to the wealthy have little stimulatory effect because they are already rich enough to buy whatever they want, regardless of the tax. Both President Clinton and President Obama have shown that the rich can be taxed heavily without hurting the economy. In both cases, the economy grew considerably when these presidents increased taxes on the wealthy. 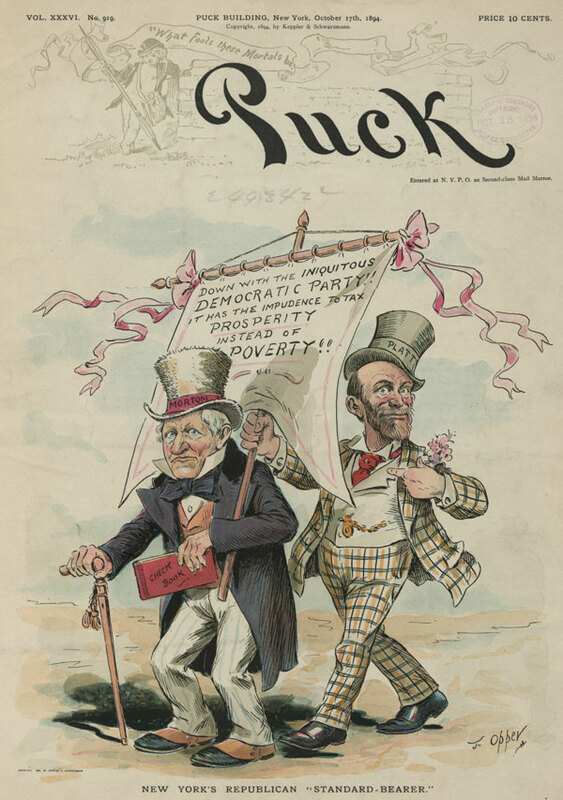 The Republicans have a long history of favoring the wealthy at the expense of the poor, as can be seen in this 1894 chromolithograph, showing Levi P. Morton with cane, holding a "Check Book", and his left arm around a standard that states "Down with the Iniquitous Democratic Party!! It has the Impudence to Tax Prosperity Instead of Poverty!! ", and Thomas C. Platt who has his right hand on the standard and is pointing to himself. Morton was a wealthy businessman, United States Senator, and vice president of the United States under President Benjamin Harrison, 1889 -1893. As they say, money talks, even in 1883. 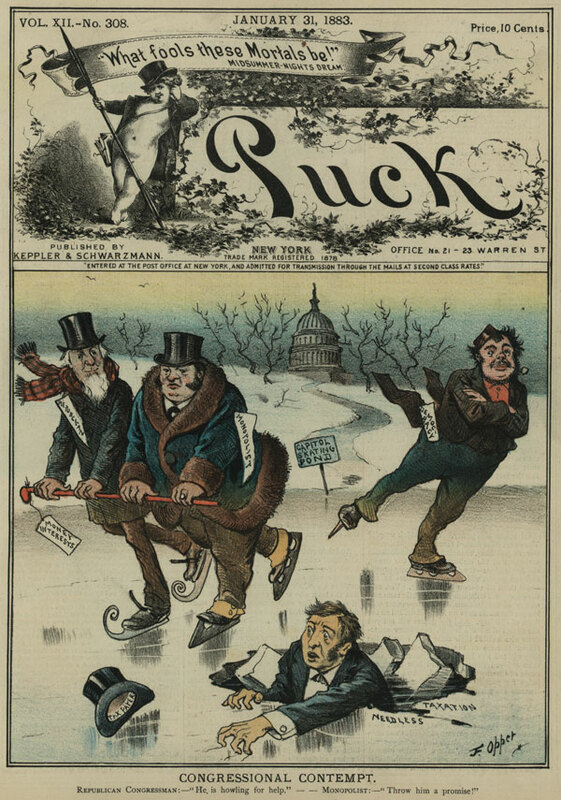 Chromolithograph of Illustration showing a "Republican" Congressman ice skating with a "Monopolist" on the "Capitol Skating Pond". Together they hold a stick labeled "Money Interests"; skating nearby is a man labeled "Democracy". Between these men is another man who has fallen through the ice at a spot labeled "Needless Taxation", his hat labeled "Tax Payer" rests on the ice. Published by Keppler & Schwarzmann, 1883 January 31. I have never seen a truly equitable tax proposed, and considering how much influence the wealthy have on members of Congress and other government officials, and considering that most members of Congress are also wealthy in their own right, it is highly unlikely that an equitable tax will ever become law — unless the people demand it.